Various characters from the Dreaming float around Dream on the cover of The Sandman Universe. Thirty years ago, the first Sandman comics introduced readers to Dream of the Endless and the denizens of the fantasy realm where he ruled. 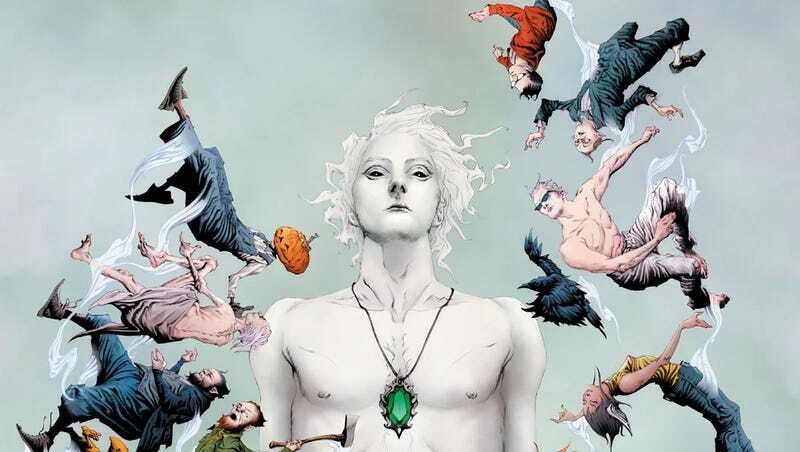 Neil Gaiman said goodbye to writing Sandman stories three years ago, but he’s coming back to oversee a bunch of new spin-off series published by DC Comics’ Vertigo imprint. Entertainment Weekly has the news on the Sandman revival, which comes in the form of four new ongoing titles which will live under the rubric of the Sandman Universe. It all starts in August with The Sandman Universe one-shot, plotted by Gaiman and scripted by Nalo Hopkinson, Kat Howard, Si Spurrier, and Dan Watters, with interiors by Bilquis Everly and cover art by Jae Lee. That story will show readers what’s been happening in the Dreaming since the disappearance of its celestial lord. The four series will each explore different aspects and characters. Hopkinson’s House of Whispers transplants vodun goddess Erzulie to the Dreaming and explores her connection to a comatose woman whose girlfriend tried to heal her using a magical tome. Spurrier will write The Dreaming, which follows loyal attendants Matthew the Raven and Lucien the Librarian as they adjust to a Dreaming without Dream. The new Lucifer title will be piloted by Watters as the Morningstar finds himself broke, blind, and trapped in a tucked-away hamlet where no one’s ever escaped. Finally, boy magician Timothy Hunter returns to grapple with his possible futures in The Books of Magic, written by Howard. ... it’s a huge sandbox with so many wonderful toys that nobody’s getting to play with right now. I started feeling guilty. I liked the idea of getting the toys played with again, reminding people how much fun this is, and also getting the opportunity to work with some fantastic writers. Down the line, there will be fantastic artists as well. Sandman has always been a personal project for you, so how did you decide to assemble a Sandman Universe with other writers expanding your ideas? There’s loads more over at EW, so head there to see more art and to read the rest of the interview.